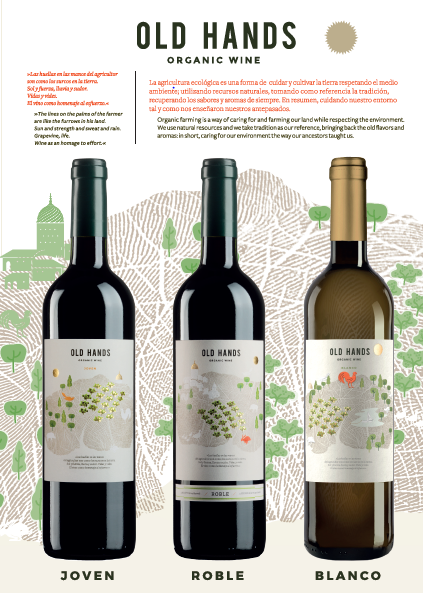 Old Hands Organic wine from Spain includes 2 reds, Jovan and Roble and a Blanco. The reds are produced using Monastrell grapes. The Jovan is a mild wine with elegant aromas and taste. This wine highlights its awesome structure with along and intense spicy finish. The Roble is kept in oak barrels for four months. The wood blends the aromas of the variety with spicy hints, yielding an exceptional quality wine. Mature tannins followed by an aromatic and long finish. The Blanco is produced using Sauvignon grapes harvested at night to preserve its scent and delicacy. The wine is very intense, fresh with a great body. It has a soft finish that invites us to keep on enjoying.